ANOTHER OPPORTUNITY TO RIDE A TRAIN EXCURSION THROUGH THE SMOKY MOUNTAINS! 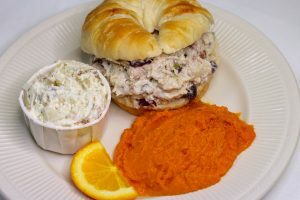 On Sunday, May 19th, 2019, the Watauga Valley Railroad Historical Society and Museum will sponsor a train excursion - a ride on the Great Smoky Mountains Railroad through the majestic mountains and beautiful countryside of western North Carolina from Dillsboro, NC through Bryson City, NC and on to the the Nantahala Gorge, NC. This trip covers all current operating trackage of the Great Smoky Mountains Railroad. TICKETS FOR THE MAY 19TH EXCURSION ARE SOLD OUT. PLEASE KEEP CHECKING BACK FOR AN ANNOUNCEMENT REGARDING OUR NEXT TRIP. IF YOU ARE NOT ON OUR MAILING LIST, PLEASE SIGN UP AT THE BOTTOM OF THIS PAGE TO BE NOTIFED ABOUT FUTURE EXCURSIONS. The Great Smoky Mountains Railroad has become a favorite of film producers over the years. The train wreck scene in the 1993 movie, The Fugitive, starring Harrison Ford and Tommy Lee Jones, was filmed in Dillsboro along the Great Smoky Mountain Railroad. [The wreckage of the set can still be viewed on the outbound train excursion from Dillsboro.] The railroad was also used in the filming of the 1996 comedy, My Fellow Americans, starring Jack Lemmon and James Gardner, when they stumble onto a charter train full of UNC-Chapel Hill fans headed for the NCAA Final Four. Train scenes in the 1998 movie, Forces of Nature, starring Ben Affleck and Sandra Bullock, also were filmed on the Great Smoky Mountains Railroad. The track follows the route of the former Southern Railway's "Murphy Branch Line" from Dillsboro, NC, to the Nantahala Outdoor Recreation Center. The line was established in 1891, with a maximum 5.8 percent grade and many bridges. Much of the route hugs the banks of the Tuckasegee, Little Tennessee, and Nantahala Rivers, and crosses Fontana Lake on a trestle standing 100 feet above the lake with a span of 780 feet. Passengers may opt to drive on their own directly to Dillsboro, NC. Dillsboro boarders will be bussed back to their parking location in Dillsboro at the end of the train ride. Passengers need to be in Dillsboro by 11:45 a.m. Passengers may catch a tour bus from Johnson City, TN, for a 8:15 a.m departure from the parking lot of Liberty Bell Middle School. Passengers may board a tour bus from the Asheville/Weaverville, NC area at the Walmart in Weaverville for a 9:00 a.m. departure for those who find that location more convenient. Before placing your order, please consider where you will be traveling to Dillsboro from, and select the best boarding location option for you. Your choice of boarding location will be shown on your confirmation form, and will guarantee you a seat on the bus from that particular location. Note: After passengers order tickets online, they will receive a confirmation of their purchase. Another confirmation will be emailed approximately two weeks after the ticket purchase and will include more information and a map to the boarding location selected. 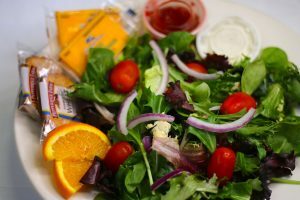 Upon arrival in Dillsboro, passengers will have time to have lunch at several restaurants in town and pickup their boarding passes at the Dillsboro Town Hall. They will get to see the Jarrett House, a hotel landmark built in 1884, and visit shops before boarding the excursion train at 12:30 p.m. for the 4.5 hour trip. The train will depart from Dillsboro at 1:00 pm. As we leave Dillsboro, we will see the Great Smoky Mountains Railroad shops and pass the filming location of The Fugitive. The track follows along the Tuckasegee River and travels through the famous Cowee Tunnel on its way to Bryson City. Rising to Fontana Lake we follow the Little Tennessee River, cross the Fontana Lake Trestle, pass the Nantahala Outdoor Center, and enter the breathtaking Nantahala Gorge, following the shore line of the exciting Nantahala River. When the train reaches the end of the line, it will return us to the Nantahala Outdoor Center, where our buses will be waiting to meet us for the return trip. We expect to arrive back in Dillsboro at 5:45pm, Weaverville by 7:00 p.m., and Johnson City by 7:45 p.m. Passengers may choose to ride in comfort in Coach, Crown or First Class. 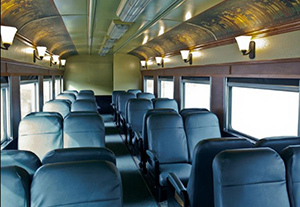 All classes offer seating in vintage, restored passenger cars. Coach Class cars feature windows that open and close for fresh–air viewing and ceiling fans. Crown Class cars offer larger windows for better viewing (windows do not open) and climate control for passenger comfort. First Class passengers will enjoy club car (lounge car) seating, where large windows offer wonderful viewing (windows do not open) and climate control ensures passenger comfort. First Class passengers will be served dinner (included with a First Class ticket) at their seat and an opportunity to order drinks (age 21 and over). All passenger cars are heated and restrooms are located on all buses and throughout the train. Tickets and pre-purchased meals may be ordered online only! Passengers may choose seating in one of three classes of comfortable train cars. NOTE: The cost is the same whether guests drive to Dillsboro or ride the tour bus. All transportation costs are included in the ticket price. NOTE: Because there are limited numbers of seats available, tickets sell out quickly (usually within an hour or so after ticket sales open). It is important that you purchase your tickets as quickly as possible after they go on sale. Passengers have several options for meals aboard the train. First Class will be served meals at their seat. 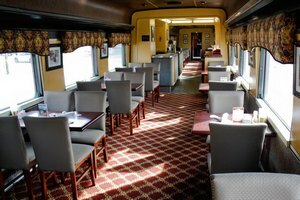 Crown Class and Coach Class guests who purchase dining car meals will choose a seating time for their meal and will go to the dining car at that time. 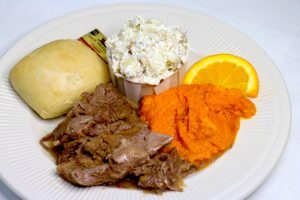 DINING CAR MEAL - Diner meals must be pre-purchased with ticket order at $15.00 per meal [included with First Class ticket purchase]. A truly unique, on-board dining experience in the grand tradition. All dinners include dessert and choice of drink. NOTE: Crown and Coach Class diners will choose from one of four dining times. Dining tickets sell out quickly. 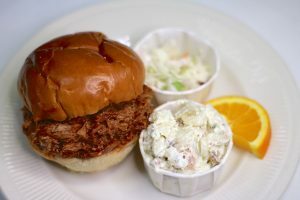 BOX LUNCH – must be pre-purchased with ticket order at $11.00 per meal. Includes chips, cookie, and choice of drink. Available for pick up in the Concessions Car. CONCESSIONS CAR – sandwiches, drinks, chips, etc., will be available for purchase on the train. BRING YOUR OWN – a small cooler is acceptable if you wish to bring food with you on the train. Our train is a SMOKING/VAPOR-FREE train, which means, nowhere on the train, at all, is there a place to smoke/vapor. Once you board the train, the ONLY place you may get off to smoke or vapor, is at the end of the train trip at Nantahala Outdoor Center. Smoking/vaporing is not allowed on the tour busses. Please do NOT wear any high heel, or open- toe shoes on board the train.When the train moves, high heel shoes may cause someone to lose their balance and open- toe shoes are unsafe to wear on the train due to gaps between railroad cars. Appropriate clothing is strongly suggested. Safety is our number-one concern. **This trip will not be handicap accessible. 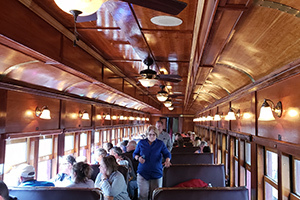 Historic and antiquated rail passenger equipment, like that used on this excursion, is exempt from ADA regulations under U.S. Code: Title 42: Section 12184. The passenger cars and station facilities used on this excursion were constructed before disability accessibility laws were adopted. Platforms, boarding areas, stairs, step-stools, seating, and especially doorways, passageways, aisles, and on-board restrooms may not accommodate all passengers. We will make all reasonable efforts to accommodate differently abled passengers who desire to ride this train. Please email us with your request if needed. The Watauga Valley Railroad Historical Society and its representatives act only as agents for the passengers with respect to rail transportation, food service, and other services offered, and as such hold themselves free of any liability for any injury, delay, loss, equipment failure, substitution, or damage from any cause whatsoever, as well as, if there are any schedule changes, weather problems, and tardiness of the train. Railroad equipment may be substituted at anytime for some unforeseen reason. The sponsoring organization is a non-profit 501(c)(3) organization and is operating the train trip to help fund restoration of railroad equipment, maintain its museum, and associated railroad historical projects. No part of the cost is tax deductible. No refunds are allowed, but we will attempt to connect you with someone on the waiting list wanting to purchase tickets. Copyright© 2019, Watauga Valley Railroad Historical Society & Museum. All Rights Reserved. Web Development by Jeff Forrester.